L’égyptologue anglais Sir Ernest Alfred Thompson Wallis Budge (1857-1934) a travaillé, à partir de 1883, pour le British Museum, où il fut en charge des antiquités égyptiennes et assyriennes. Il est surtout connu pour ses travaux sur le Livre des morts du Papyrus d'Ani. Ses fonctions au sein du musée londonien l’amenèrent à effectuer de nombreux voyages en Mésopotamie, en Égypte et au Soudan. “The age of the Sphinx is unknown, and few of the facts connected with its history have come down to these days. Some years ago it was generally believed to have been made during the rule of the kings of the Middle Empire over Egypt, but when the stele which recorded the repairs made in the temple of the sphinx by Thothmes IV., B.C. 1533, came to light, it became certain that it was the work of one of the kings of the Ancient Empire. The stele records that one day during an after-dinner sleep, Harmachis appeared to Thothmes IV., and promised to bestow upon him the crown of Egypt if he would dig his image, i.e., the Sphinx, out of the sand. At the end of the inscription part of the name of Khā-f-Rā or Chephren appears, and hence some have thought that this king was the maker of the Sphinx ; as the statue of Chephren was subsequently found in the temple close by, this theory was generally adopted. An inscription found by Mariette near one of the pyramids to the east of the pyramid of Cheops shows that the Sphinx existed in the time of Khufu or Cheops. The Egyptians called the Sphinx ḥu , and he represented the god Harmachis, i.e., Ḥeru-em-khut , “Horus in the horizon,” or the rising sun, the conqueror of darkness, the god of the morning. On the tablet erected by Thothmes IV., Harmachis says that he gave life and dominion to Thothmes III., and he promises to give the same good gifts to his successor Thothmes IV. The discovery of the steps which led up to the Sphinx, a smaller Sphinx, and an open temple, etc., was made by Caviglia, who first excavated this monument; within the last few years very extensive excavations have been made round it by the Egyptian Government, and several hitherto unseen parts of it have been brought to view. 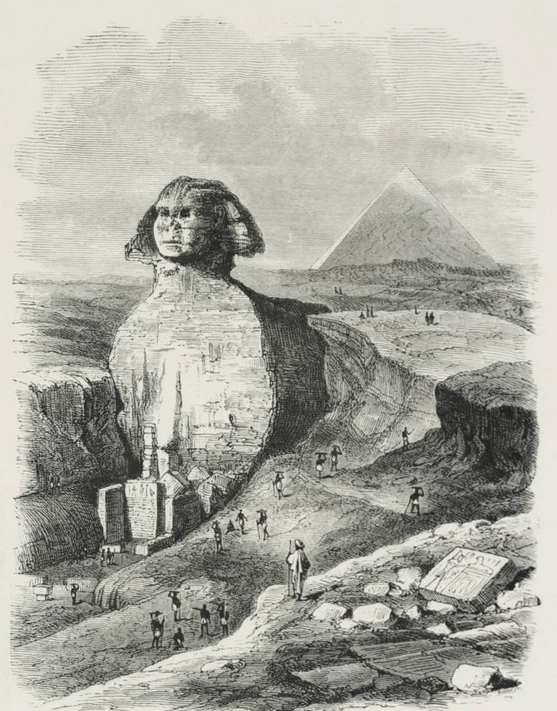 The Sphinx is hewn out of the living rock, but pieces of stone have been added where necessary ; the body is about 150 feet long, the paws are 50 feet long, the head is 30 feet long, the face is 14 feet wide, and from the top of the head to the base of the monument the distance is about 70 feet. Originally there probably were ornaments on the head, the whole of which was covered with a limestone covering, and the face was coloured red ; of these decorations scarcely any traces now remain, though they were visible towards the end of the last century. The condition in which the monument now appears is due to the savage destruction of its features by the Muḥammadan rulers of Egypt, some of whom caused it to be used for a target.